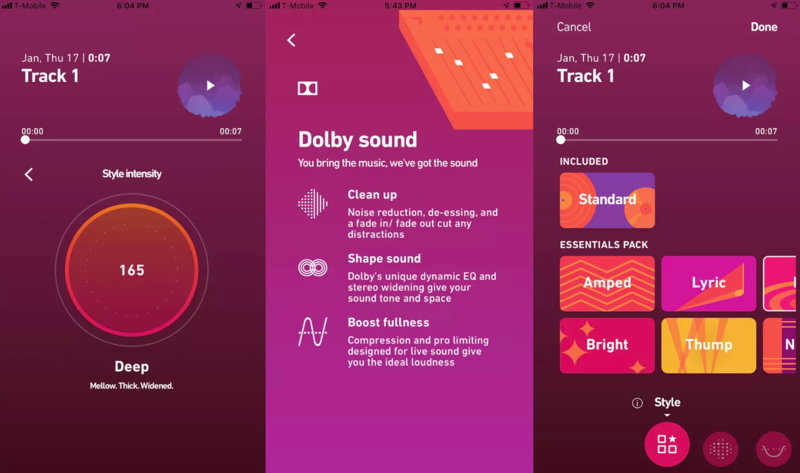 The sign-up site, which has since been deactivated, advertised the app by saying: “How can music recorded on a phone sound so good? Dolby 234 automatically cleans up the sound, gives it tone and space, and finds the ideal loudness. It’s like having your own producer in your phone.” Those are big claims. Luckily, I snagged a copy of the app before the Dolby 234 site was deactivated and have been playing around with it to test it out. The app itself is incredibly easy to use. Simply tap the record button and the app will measure room tone for a few seconds before starting the recording session. Once you stop recording, you can quickly polish the audio through adding a preset and tinkering with a few tools. Tool options include eliminating the room tone (unwanted background noise), adjusting the amount of bass and treble, adding “boost” (loudness), and trimming. The app only comes with one preset but an “essentials” pack unlocks six more. These extra presets are available through a seven-day free trial and each is described with a few keywords. For example, “Lyric” is “full, smooth, and balanced,” while “Thump” is “deep, full, and powerful.” Unfortunately, you can’t see what’s under the hood for each preset. It only lets you adjust “intensity,” which is how much of the audio signal is sent through and affected. Once you’ve finished adjusting the recorded audio, you can rename it, and choose to share it to Dolby or to SoundCloud.